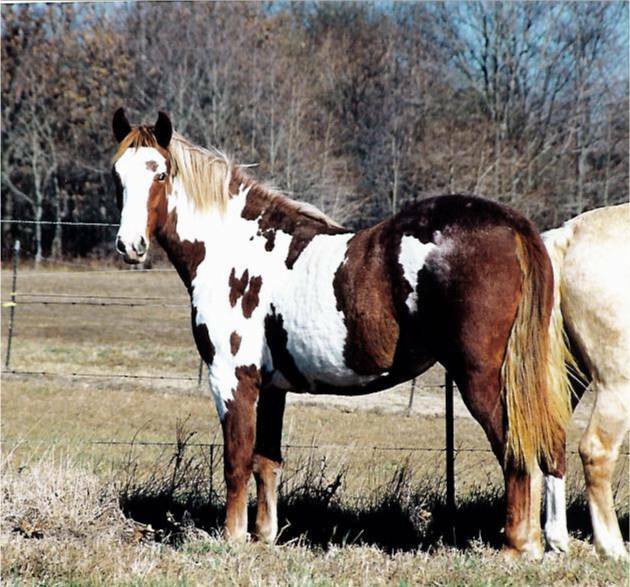 Below is a son and daughter of Peppy..they are both frame overo's...they both have dark legs on 1 or more legs and white that does not cross the topline. They also have a horizontal white pattern and jagged edges like cloth that has been ripped on a nail. If they had sabino in the pattern, the edges would have been lacy and not as distinct. I thought I would add some information about overos as I understand it. Overos come in 3 different designs and combinations of them. The most common is the Sabino , then the Frame and last the splash. It is sometimes very hard to tell by looking at some horses which they are. I like to see what the parents and grandparents look like if possible. 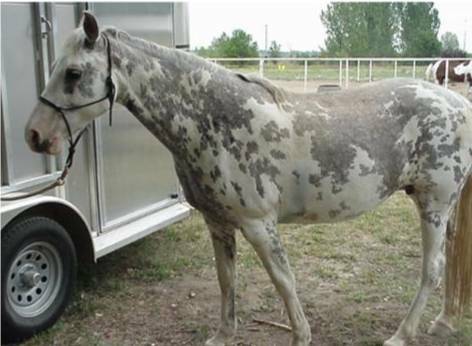 My stallion Peppy is a combination of frame and sabino...therefore his jagged edges turn into speckled lacy edges. The only way I am sure he is a combination is his grandsire is a obvious frame overo. 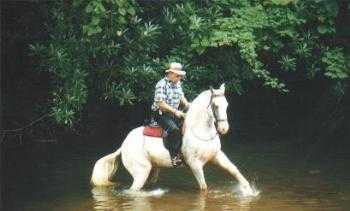 Plus Peppy has produced both frame and sabino foals.. otherwise a person could argue his pattern genetics forever. The splash gene appears not to have the lethal white but I don't believe enough studies have been done to be definite about that. Now that said, lots of people are really freaked out by the lethal white of the frame overos. Actually it is only a problem if you breed two frame overos. 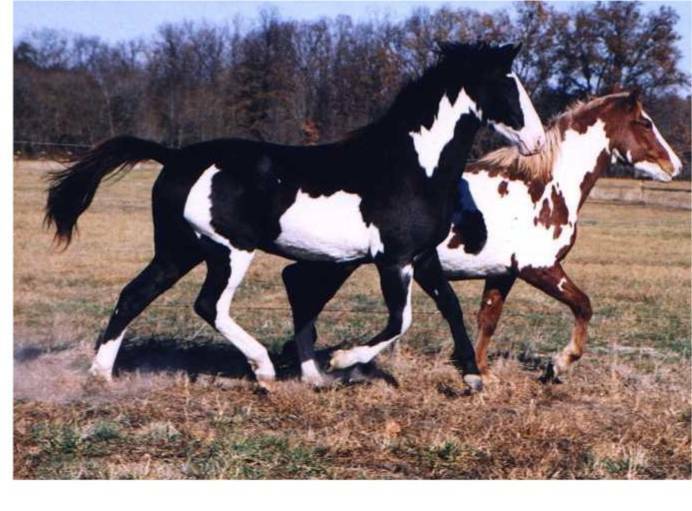 Or breeding two horses that carry the frame gene even though they may not have spots. (this has happened in APHA horses) The good news is that through pedigree research and DNA testing you can find out if your unusually spotted overo is a lethal carrier or not. Once you find out that your horse is a LWO carrier, just don't breed him or her to other LWO carriers. The other factor is that even if you do breed LWO carriers together your chances are 1 in 4 that the foal will be born a lethal white. Now I don't advocate breeding two carriers, but people have done it, knowing the odds and have a 50% chance of a frame overo and a 25% chance of a solid and 25% chance of a lethal white.. VERY IMPORTANT NOT ALL SOLID WHITE FOALS ARE LETHAL WHITE!!!!!!!! Solid white foals are born that are maximum expression Sabinos. Also cremellos appear to be solid white. Sabinos may or may not have blue eyes, cremellos usually have blue eyes... DO NOT DESTROY your white foals they most likely are Sabino or cremello. The frame gene is so rare in the fox trotter breed you are not very likely to have a lethal white. The beautiful mare pictured below is a TWH who is a maximum Sabino...wouldn't it have been as shame is someone had destroyed this beautiful girl thinking she was a LWO!!! Here is are sites I really like that gives some good examples of paint color patterns and explains the differences very well. Also note on the Colored horses site they have provided highlighted links to pages specifcally about one pattern or another with more expamples such as the exteme white sabinos and what they produce . She is a good example of a sabino overo..note the speckled bird egg look or some call it lacey. Note most sabinos have all 4 legs white or high white socks and bald, apron faces or all white heads. She appears to be a rose grey on top of the sabino...what a combination of genetics! 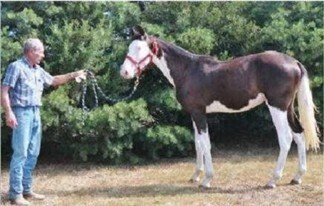 This is a example of a frame overo. She shows no sign of the sabino gene. Note she has a wide blaze (some call this bald but I don't) not a bald face. She also has 3 dark legs without sock, and only one leg with a stocking much like solid color horses have. Also her markings are jagged rather than lacey or freckled as in the sabino. Also she does not look like she was dropped feet first into white paint as the Splash colt below does. This is Loud and Proud owned by Earnie Long. He is a great example of the Splash overo. Although there is a possiblity that he could be sabino (all the Clydesdales are sabinos and some come out similar to Loud & Proud). 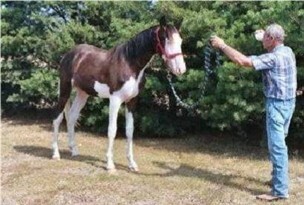 The splash overo typically has all 4 legs with socks or all white legs. Many times they have an odd white streaks that runs over the body usually from a leg up over the hip or the neck or shoulder. This streak of white is sometimes a narrow 1/2 inch strip to 3 or 4 inches wide. Sometime they also have a white spot on the belly or as in Loud & prouds case a all white belly..but the lines are clear and distinct and flow rather than lacy like the sabino or jagged like the frame. Loud & Proud belongs to Earnie Long of Meriden, Kansas and is for SALE...contact Earnie at elong@umacs.net.